My boyfriend and I ventured to Takorea to partake in their brunch one Saturday afternoon. Takorea was one of my favorite restaurants when I worked in Tech Square, so I was excited to try their brunch. What I ate: As someone that loves red bean pastries, I ordered the Sesame Chicken and Adzuki Bean Waffle. Ed ordered pork belly chilaquiles. I…still have a sorted relationship with chicken. So I played it safe, like a 6 year old, and really just ate the skin. Don’t judge me, but their sauce was great. It wasn’t as sweet or syrupy as your usual mom-and-pop Chinese spot by the house, so don’t order this thinking that’s what you’re getting. And because I really enjoy the sweet, stickiness of anything with red bean in it, I knew the waffle wouldn’t disappoint. 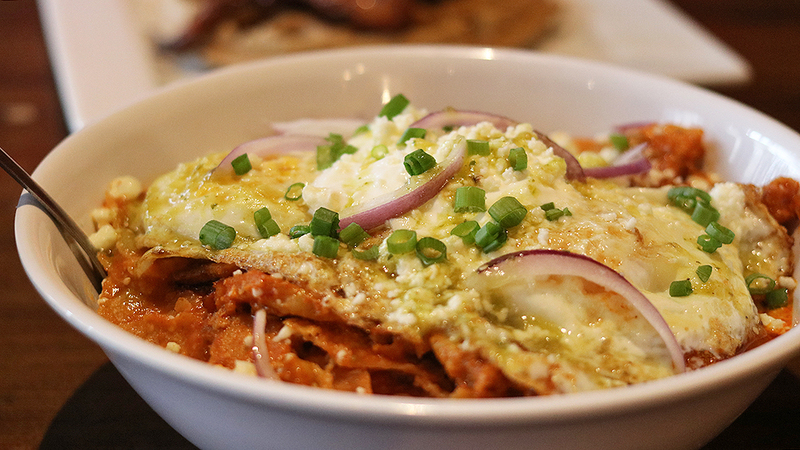 Ed has been on a chilaquiles kick as of late, so he loved this dish. And honestly, you get a healthy portion so he didn’t even end up finishing. That dish could easily become at least 1-2 more servings. What I’d order the next time: I was so impressed with my Red Bean Waffle that I’d like to try their Adzuki Bean Pancake. I’d likely order an appetizer too. What all can you order? 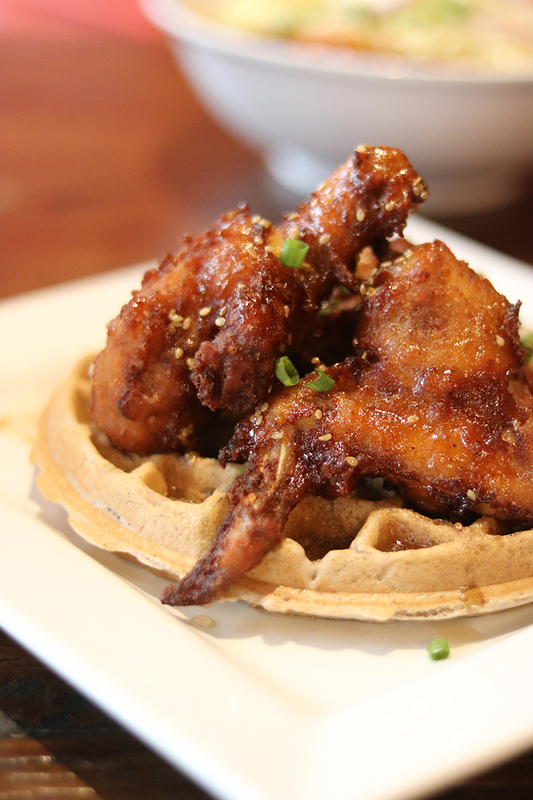 Their brunch menu varies, but the signature items are the Shrimp & Grits, Sesame Chicken & Adzuki Bean Waffle, and Chilaquiles. Overall food price range: Brunch entrees start at $10, so this is an affordable brunch location. What I drank: I ordered a Sangria and Ed ordered a mimosa. 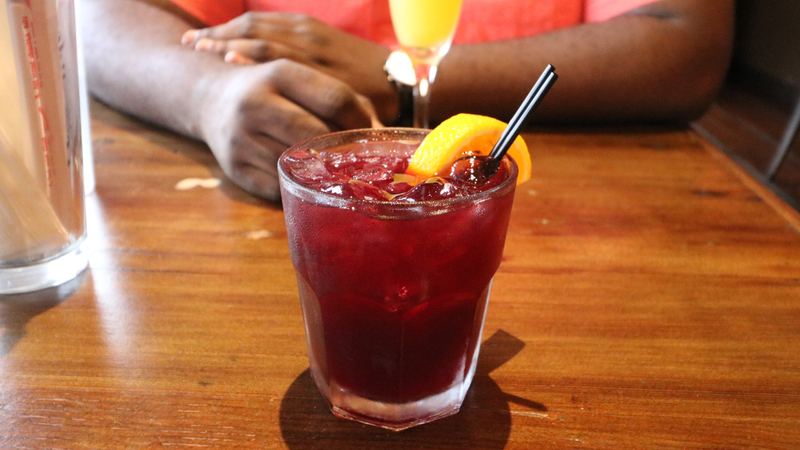 Standard brunch drinks are usually our wave. What I’d drink next time: I’d get another Sangria. What are other drinks you can order? Their regular menu is also available at this time, so any cocktails offered are available for purchase. Overall drink price range: Brunch cocktails are $4 a glass. 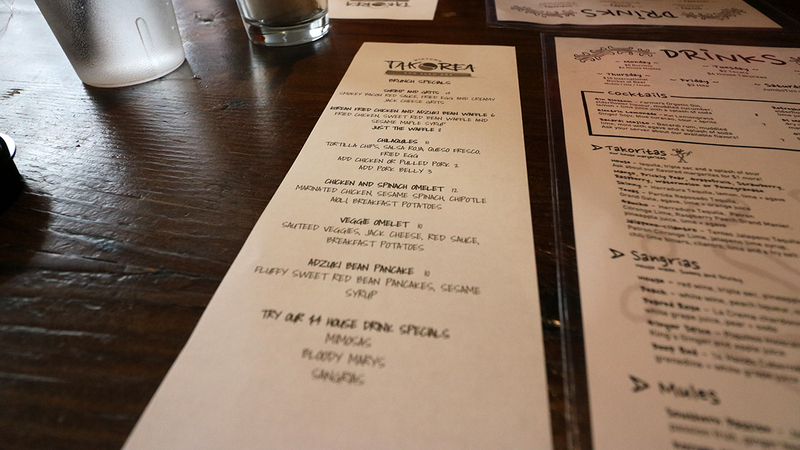 Describe the vibe: Takorea feels like a beach restaurant that was located in midtown Atlanta. By that, I mean they have retractable windows, wooden tables and chairs, and peach-colored walls. The restaurant is always moderately busy whenever I’ve gone, which means it’s easy to get in and out. I’d come back with 3-4 friends for a good time. Does the restaurant have any outdoor seating? Nope. 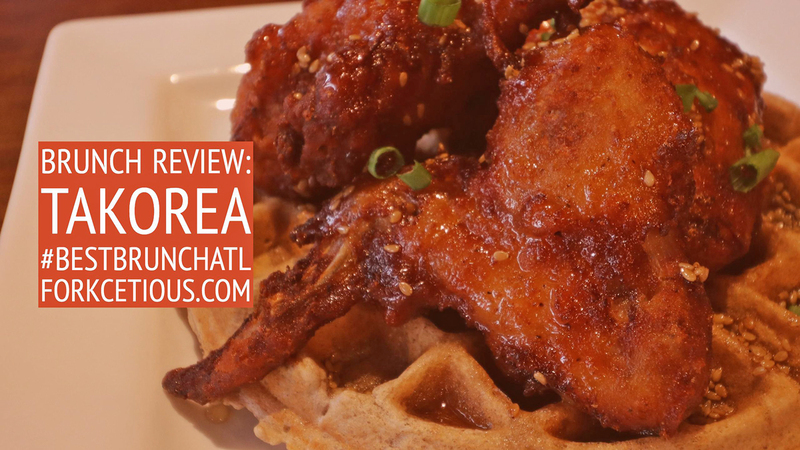 Area: Takorea is located in Midtown Atlanta off Juniper Road. Brunch time: Brunch is served on Saturdays from 11:30 a.m. – 3:30 p.m. and on Sundays from noon – 3:30 p.m. So, how was brunch at Takorea? I liked it. I think I played it safe with the chicken and waffle plate, but you can still get the fusion flavor by picking any of their brunch offerings. It’s hard to make me stop liking a restaurant I adore, so I’m always going to be here for Takorea. Disclosure: Our meals were compensated in exchange for writing this blog post. All opinions and commentary are mine alone.